A photo of Meghan Markle was posted to Instagram recently before quickly being deleted from the site. While the Royal Family might be trying their best to keep tabs on photos which get released to the world, there’s always some which manage to slip through the cracks. Prince Harry’s naked Vegas photos certainly set a high standard for the kind of unwanted images which get shared, but last week, a photo of Meghan obviously wasn’t to royal taste, and it was swiftly taken off social media. The 37-year-old made a surprise appearance at the British Fashion Awards on November 10, where she presented Clare Waight Keller – the woman responsible for Meghan’s Givenchy wedding dress – with a special award. 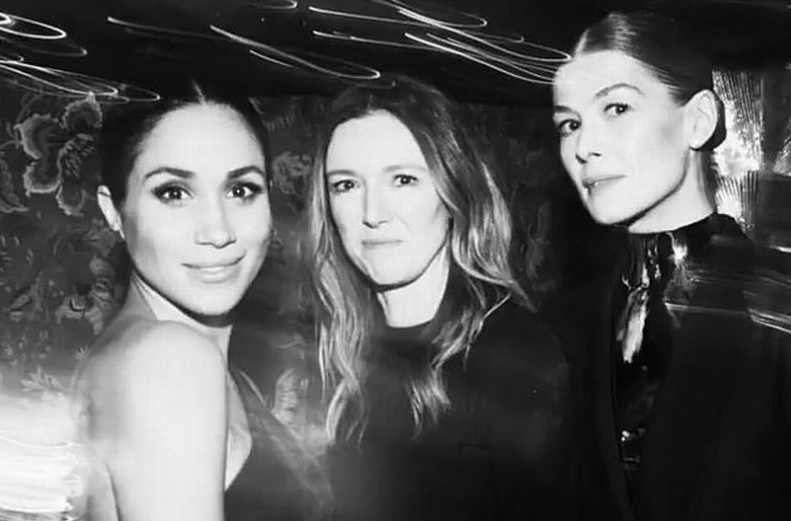 Proving that even members of the Royal Family can be basic, Meghan took part in a Boomerang alongside Keller and actor Rosamund Pike while in a photo booth backstage at the event. The GIF was shared to the Instagram pages of both photographer Yvan Fabing, and the official British Fashion Awards, and showed the mother-to-be cradling her baby bump while lights from behind illuminated the three women. Although Fabing shared many similar posts of other celebrities in the photo booth, Meghan’s has since been deleted from both accounts, sparking rumours Meghan herself – or perhaps representatives for the Royal Family – asked for it to be taken down. A royal source spoke to the Mail on Sunday about why the post might have been deleted, suggesting it may have had something to do with the fact The Queen hated part of Meghan’s Fashion Awards look. There was something ostentatious in the way she was posed holding her bump, plus she was wearing dark nail varnish that The Queen hates. It wouldn’t be surprising if, aware of that, the Duchess herself asked for it to be taken down. I mean, my grandma doesn’t like it when I wear black nail varnish, but that wouldn’t stop me sharing a good boomerang. Those things are hard to perfect! Also, surely anyone holding their baby bump is ostentatious in a way? While it’s a protective movement, it still highlights the fact you’re pregnant, and there’s nothing wrong with showing off the fact you’re carrying a human life inside you. Unless, apparently, you’re part of the Royal Family. After the British Fashion Awards account deleted the boomerang of Meghan, they posted a more conventional shot of her presenting on stage at the event. Significantly, it was the same image which was shared on the Kensington Palace Instagram account, suggesting it ticked the boxes for a good Royal photo. You might notice the black nail varnish is barely visible, and there doesn’t seem to be any ostentatious baby bump-cradling. 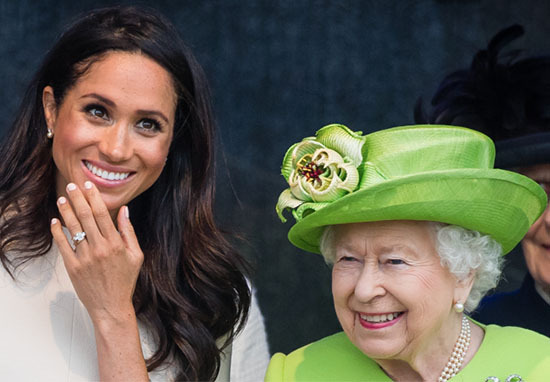 A new paper written by academics Laura Clancy and Hannah Yelin, claims Meghan’s social conscience has been ‘muted’ by her new family; a suggestion which could be supported by the removal of her down-to-earth Instagram post. While the monarchy appears to be celebrating her diversity and modernising influence, then, this is only permitted within prescribed boundaries. Markle’s activist voice has been either silenced or appropriated by the monarchy. She has quit her acting career, closed down her popular blog and social media accounts for all her online activity to be ciphered through Kensington Palace. Meanwhile, Markle is said to be receiving ‘duchess lessons’ from the Queen’s advisers, to be brought up to speed with protocol and expectations of life with the monarchy. It’s certainly an intriguing situation!